The half marathon is my favorite distance to race. It is a challenging distance that requires significant training in order to be successful. But it does not take the devastating toll on the body that the marathon does. The half has the feel of a big race, unlike most 5K and 10K events. There has been some discussion within the running community about the name “half marathon.” Several years ago a movement started to call it the “Pikermi.” Pikermi is a town in Greece roughly halfway between Marathon and Athens. According to legend, in 490 BC a messenger named Pheidippides ran the 26.2 miles from Marathon to Athens to deliver the message that the Greeks had defeated the Persians in the Battle of Marathon. This is where the marathon got its name and its distance. The idea behind renaming was that the term “half” somehow diminished the 13.1 mile distance. But the idea never caught on. More diminishing to the distance in my mind is the term “Mini Marathon” that seems to be popular in the Midwest. I ran my first half marathon in Detroit in 2008. It only took that one race to get me hooked. I’ve since run a total of 14 half marathons in Michigan, Ohio, Kentucky, Pennsylvania and Florida. Each was both challenging and fun in its own way. 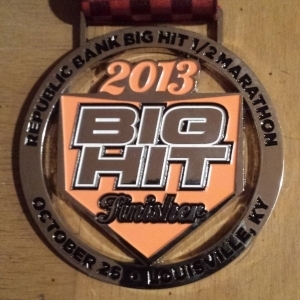 My favorite was the Big Hit Half Marathon in Louisville in 2013. The Big Hit begins outside of Louisville Slugger Field, home of the Louisville Bats. The Bats are a Triple-A affiliate of the Cincinnati Reds. The race winds through downtown Louisville then out to Churchill Downs, site of the Kentucky Derby. After returning downtown, runners enter the stadium and cross the finish line at home plate. In 2013 I crossed that line in one hour, 50 minutes and 54 seconds, my personal best. I ran the half marathon distance yesterday, but it was not a race. It was a training run that completed my 8th week of training for the Chicago Marathon. I ran with Team World Vision on the very hilly section of Hines Drive that is our standard course. TWV provided water stations on the course that were staffed by friendly and encouraging volunteers. The weather was perfect for a long run. I completed the distance in 2 hours and 17 minutes, the same as my slowest ever half marathon race. Yet as a training run, at 10:29 per mile I was just 1 second off of my goal pace. It was a good run. Today is my one planned rest day of the week. And I need it. I’m tired and I’m sore. The week ahead is a slight but planned step back. 24 total miles, with the longest run only 10. The the real work begins.